I have visual studio 2010 and I installed the trial for 5.1.3000.12 and I no longer have the 'testm' snippet to create an mstest test method. I still have 'testc', and get the snippet in the original intellisense if I turn off R#'s intellisense, but wondered if anyone knows how to get 'testm' in R#'s intellisense? in Visual Studio built-in IntelliSense? Thank you! knows how to get 'testm' in R#'s intellisense? I've attached a screenshot of the R# intellisense without it showing the testm snippet. 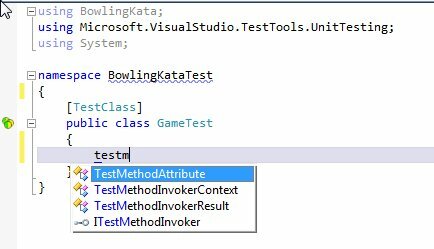 If I hit Tab, which is the normal way to select the snippet in the VS intellisense, it instead chooses the first in the list (only the TestMethodAttribute). I did discover, however, that if I instead hit Esc to close the R# intellisense and the hit tab with "testm" in place, it does execute the snippet (as you suggested). However, it would be much more desireable for the snippet to be included in the list and save me the extra Esc keystroke. with "testm" in place, it does execute the snippet (as you suggested). included in the list and save me the extra Esc keystroke.